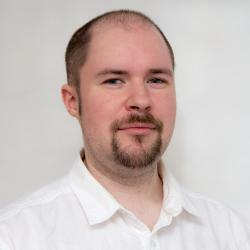 Do your games need more skills than you have fingers? An MMO mouse might be just what you need. Corsair takes a stab at the monolithic MMO mouse once again as we review the 17-button Scimitar RGB. With a whole lot of lighting and CUE integration, Corsair just might help you keep your button assignments under control. Online games often have an unrealistic expectation of human anatomy and ergonomics. You need to have a hand with 12 fingers, capable of extending over 8-inchs, another hand to set modifiers and select party members with F-Keys, also doubling up use with the numpad, map, inventory management and so on, oh and a mouse to look around and click things; ideally, you need 3 hands. Good thing we have gaming mice that can help alleviate the complications of control overload. Under review today is Corsair’s Scimitar RGB gaming mouse that comes equipped with a grand total of 17 buttons, all fully programmable; 12 of those buttons happily perched under the thumb for easy access. A bit over the top for some, but invaluable when you are confronted with an archaic game requiring more abilities and hot-keys than is ergonomically possible. We have reviewed a couple of these multi-button monolithic MMO/MOBA gaming mice before. They are very specialized devices that only a few would likely need; but if you are serious about your games – or just want a whole bunch of macros at your literal finger tips, then these mice certainly have an appeal. Corsair has attempted an MMO mouse before with the M90, reviewed a few years ago, which was updated to the M95 later on. At the time, it was interesting to see such an odd button layout, placing buttons in a styled circular array around the thumb. It lacked a certain amount of precision due to clicking buttons off-center, often resulting in nothing happening. The M95 attempted to fix this with some minor adjustments to help sharpen up those off-center clicks. Corsair's Scimitar RGB MMO Gaming Mouse with braded Cable and molded USB plug. The Corsair logo on the back illuminates. The textured grip on the right side. Profile view of the back of the Scimitar. ...or slid forward for larger hands. In total there is about a half-inch of travel. The slider can be locked and unlocked with the provided Allen key using the screw on the Scimitar's base. 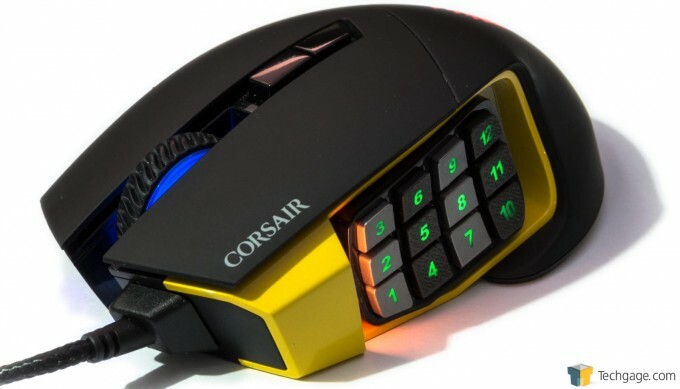 The newly released Scimitar RGB by Corsair we’re reviewing today, takes a more traditional layout (as far as MMO mice go), by placing the buttons directly under the thumb in a 4×3 grid of 12 square buttons. The party trick? The button array can be slid back and forth to accommodate different sized hands and natural thumb positioning. Throw in a bunch of LED arrays that can be set to any color, and we have disco and dance mat in a mouse. Many of the hardware features we see with the Scimitar are a standard affair with a premium mouse. I say standard, but some are bordering on the insane at this point. Take for example, the rather extreme 12,000 DPI laser sensor. Useful if you have 3x 4K monitors with a twitch-reflex FPS at play, but a little too sensitive for the average user; this can be dialed back to as low as 100 DPI, with independent X/Y adjustments. The software allows for a great deal more control over this, which we’ll get to later. The Corsair Scimitar RGB is a right-handed mouse only at this point, as is common with most MMO mice. It’s rather chunky in size, to accommodate the large sliding grid. There are five other buttons, including two DPI selectors which can be re-purposed as profile switchers (complete with a different DPI). The scroll wheel is quite large and thin, with a an easy-grip surface; it doesn’t support horizontal scrolling. Corsair’s Scimitar RGB on the left, the aluminum framed M90 on the right. One curious change compared to previous Corsair mice is the largely plastic construction. The M60/90 had a very solid aluminum frame and were built like tanks, without being too heavy either. The Scimitar RGB has an aluminum core in the center, where the sensor and 12-key grid slide against, but the rest of it is of a rigid plastic. It doesn’t feel cheap if that’s a concern, and it does have a little bit of weight to it. The right-side has a rubberized textured grip which prevents accidental sliding. 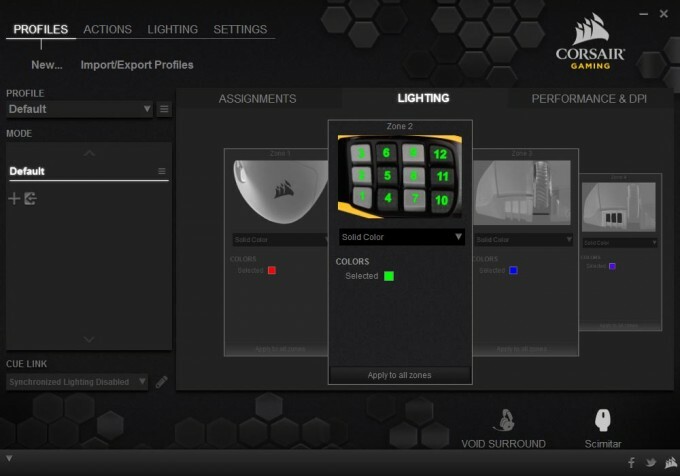 There are five different lighting zones, each can be set to specific colors and patterns through the Corsair Utility Engine – CUE. There is the froward facing plate where the cable comes out, the scroll wheel is semi-opaque allowing for a rich glow, the light just in front of the 12-key grid can change color based on the profile, the 12-key grid itself can have different lighting patterns programmed in, and finally, the palm rest can lights up. That’s a lot of lights to play around with, and all of them can be set with and color. The rest of the hardware is all the standard stuff like a braided cable, 1000Hz poll rate, et cetera, but where the fun actually begins is the software… and boy, has Corsair been busy with CUE. Corsair Utility Engine – CUE, is a universal driver and application interface for all of Corsair’s more recent peripheral product launches. This helps unify all the different applications that some other companies have required in the past, and is more in line with what Logitech have done for a few years. CUE will change itself based upon what peripherals you have, but any lighting effects and macros you have created for one device, can be transfered and used on another. Building such a large application for all the different peripherals has introduced a number of issues, while as diverse and feature rich as the software can be, it can be a little overwhelming and confusing to use. It’s possible to build up layers of lighting effects and forget some of them are running, or that there are certain actions hidden away amongst a multitude of drop-down menus and overlays. If you are new to CUE, then things will seem a little daunting. The basics of the Scimitar RGB in the CUE software are fairly straightforward. Under the main profile page is where button assignments can be made, and this is likely where most of your time will be spent. The one oddity I found with the 12-button layout was that the numbering is reversed from what I would normally expect. Instead of labeling from the top down (1, 2, 3), left to right, it starts from the bottom and works up (3, 2, 1). This is not a huge issue, as long as you pay attention to the numbering on the mouse, as I ended up reversing the ordering myself. We’ll get into the macro and key assignment in a bit. The back of the Corsair Scimitar RGB, illuminated. Any Color can be used. The 12-button grid in green and profile light in orange. Side view of just the 12-button grid lights. Scroll wheel in deep blue, and the front-facing light in purple. All colors can be edited with different patterns. The second tab is dedicated to lighting, where each of the four zones can be adjusted. Basic effects such as solid colors or two-tone fades can be assigned with any color pattern, as well as a rainbow sweep. Earlier I said there were five zones; the last one is assigned on the DPI adjustment. This can only be assigned a solid color, but it can still be any color. If you have other Corsair devices, the Scimitar RGB can use the same color profiles you saved with them. There are other software hooks as well that can change the lighting on the mouse when you change profile on the keyboard. Lots of integration options. The final tab covers the basic performance of the mouse, including DPI levels (up to five available), the lighting mode for each, any X/Y offset, and slightly more advanced features such as lift-off height detection, angle snapping, enhanced pointer precision (Windows mouse acceleration), and the software-based pointer speed. All of the above is pretty basic, and what you would normally expect from any old gaming mouse. Where things really take off is the multitude of options that can be tweaked for actions, macros, and software compatibility. As much as I would like to cover all the different aspects of the CUE software, there is just too much to handle for this review. It goes without saying though, that pretty much any kind of action, be it macro, application launch, shortcut or button assignment can be made to pretty much any button on the mouse. Corsair refers to any of this functionality as an action. Macros can be recorded, edited and configured with relative ease. While it defaults to just keyboard actions only, the CUE preferences can be setup to record mouse movement and button presses as well. Repeats, toggles and minimum delays can all be set. If you want to record just text strings, there is a separate section for that, so you do not need to build and decipher a large macro of up and down key presses for such utility. Text can be set as either typed, or as a copy/paste command (with delays if need be). Similarly, modifier keys and short keystrokes (CTRL+ALT+D for example) can be created as a separate action without recording it as a macro or text input. Corsair's Scimitar RGB CUE Button Assignment. 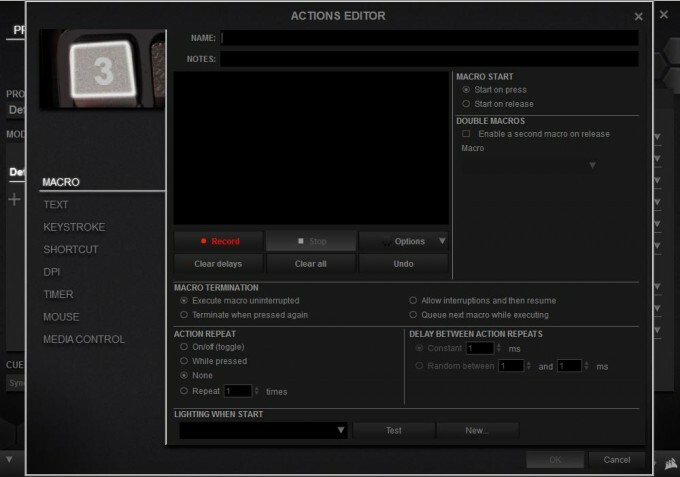 Actions or key remapping can be set with a right-click. The four main lighting zones can be configured with solid, alternating, or rainbow spectrum color shifts. DPI level indicator is on the forward side of the mouse, and is the fifth color zone that can be edited. Only solid colors can be assigned. Macro recroding - mouse movement and actions can be recorded too by setting the option as seen in the last slide. For text strings, use the text editor. It can either type out the text with delays, or it can paste the text. If you wish to just set a keyboard modifier command, such as CTRL+ALT+U, then you can set that under Keystroke. DPI overrides, with Sniper capabilities for fine control. The Corsair Scimitar RGB isn't just for MMOs. Another great feature is the ability to set timers with actions, that can also be seen on the on-screen-display pop-up. Assign specific mouse buttons, such as back and forward for web browsing. Media controls, such as volume, pause/start, and track skipping. Under Settings - Program, the macro record settings in the bottom left can be set to record mouse movement and clicks. There is a section dedicated to DPI adjustment, so you can configure one-touch access to specific DPI levels, or toggle Sniper mode. These DPI levels are set independently of the main DPI section of the mouse preference. There is also sections for setting up application launchers and media controls. The last section is definitely a novelty as far as peripheral software goes, and one of the defining features of an MMO mouse – Timers. Once setup, you can enable the timer to kick in, play a sound, and have an on-screen warning. Once the timer expires it can also trigger a pre-configured action/macro. Anyone that’s played any high-level raids will understand the value of this. If you wish to set each of the 12 buttons to it’s corresponding place on the keyboard (1,2,3… 9, 0, -, =), then instead of assigning an action, you can simply remap the button. By right-clicking the button you wish to change, you can bring up the remap menu, and then you can select from any of the different groups, such as alphanumeric, mouse, media, or hotkey. While we have covered most of the details already, there are still a few oddities to consider when using the mouse day-to-day. Initially, there were some teething problems with the Scimitar RGB. Not long after setting up the mouse and doing some basic tests of the the key remapping, the mouse ‘forgot’ its configuration. Despite everything being setup in the software and initially working, it just suddenly stopped for no reason. This forgetfulness happened on a number of occasions, and I became concerned that the mouse might have been defective. After some pondering from previous Corsair mice, I re-flashed the firmware (same version), and magically, all issues stopped. For some reason, early versions of Corsair’s mice tend to be a little temperamental when it comes to firmware. When in doubt, re-flash. The firmware has been updated a couple times since its release and these issues are now much less common. There is a consideration that needs to be made before you take the plunge – Corsair’s Scimitar RGB has no memory. If the software stops, crashes, or doesn’t load on system startup, the mouse is effectively limited to 3-buttons and a DPI selector; none of the 12 thumb buttons will do anything. If you frequently swap hardware around, then you will need to load up the CUE software and import your profile to use it on multiple systems. Lack of memory in hardware is not new, and it’s just the nature of peripherals now, as they have so many features that it would be extremely difficult to enable them in hardware only (while keeping it compatible with multiple OSes). As powerful as the software is though, CUE still continues to have teething problems with a number of users. Our experience with this was limited, but not completely error free. CUE receives regular updates every couple weeks or so, to help resolve issues with its growing number of supported peripherals. Software aside, the Scimitar RGB’s hardware is fundamentally faultless. The 12 thumb buttons are sharp and responsive, with good separation between then to help with blind navigation. There is very little wobble, and responds well to off-center clicks. There is a very small amount of give before actuation, but not enough to reduce response time. If there was one thing I’d like to see, it’s the inclusion of a center marker, a bump under the thumb on one of the central buttons so you know where you’re thumb is. Each column has alternating rough and smooth texturing to help, but without some kind of center post, I’d often rest my thumb on the wrong row. While the slide might be seen as a gimmick, it actually does help. There is an Allan key that’s used to unlock a screw in the base, which lets things slide around. This lets you find the most comfortable position for your thumb to rest with easy access. Letting it free-float is also an option. The middle mouse is very smooth with scrolling , with only a small bump per rotation – very quiet as well. It also doesn’t require a lot of force to push down either, making it useful for a push-to-talk button for long gaming sessions. The sensor proved to be very capable, tracking on a multitude of surfaces. Adjusting the lift-off height detection was actually useful. Overall, Corsair’s Scimitar RGB hardware that we reviewed was fantastic, well built, sharp, and illuminated to the gills. The software is extremely comprehensive, and there are features for nearly every scenario you can think of. The main issues with the software though are that it’s not the most straightforward to use and setup initially, but once you have its system figured out, it’s passable. There are still some bugs that need tweaking though, such as some applications suddenly stop responding to the 12-key grid (most notably Teamspeak). Pricing puts the Scimitar RGB just around Razer’s Naga at around $70. Logitech has its G600 (reviewed) as well which can be found for quite a bit less at $40. While the G600 has very good software, it may not be as comprehensive as the Scimitar’s. As reviewed, we can highly recommend Corsair’s Scimitar RGB MMO mouse if you find yourself shorthanded when it comes to accessible buttons. It’s a very well constructed mouse with sharp and responsive buttons, capable of handling any MMO/MOBA you can throw at it. Learn how to use the software, and you’ll be set. Solid build with aluminum core. Software feature set is exhaustive with nearly every function you can think of. Shared effects and interoperable with other Corsair peripherals. Software is a little glitchy at times and hard to use initially. No memory, requiring the CUE software to be installed on each PC.